Capital Brewing Co’s bar, made of antique oregon, sourced from Thor’s Hammer, Yarralumla, ACT. Photo Chris Shanahan. Like a captain on a ship’s bridge, brewer Wade Hurley turns from the glowing instrument panel, steps across the metal control deck, and pours hops into the gleaming steel kettle. The steaming vessel digests the bitter green pellets. 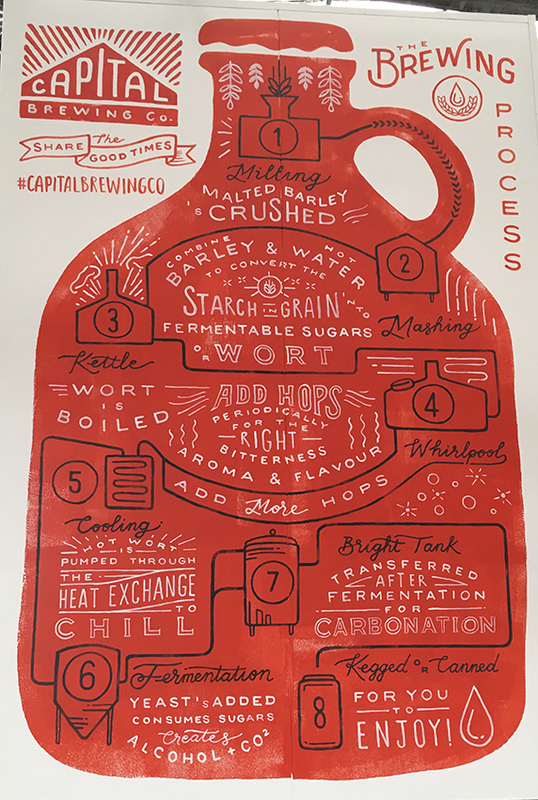 Instantly, pungent hop aromas join the heady, sweet smell of warm barley malt in Capital Brewing Co’s Fyshwick brewery. The brewery and taphouse opens to the public on Saturday 9 September, 17 months after Capital released its first beers into the Canberra market. Until the Fyshwick brewery fired up in August, Hurley made the beers in Sydney, “Mainly at Hairyman Brewing, Caringbah”, says Capital director Nick Hislop. Co-founder Laurence Kain said, “It’s phenomenal to think that in only a little over 12 months, the support for our beers has allowed us to put down our own bricks, mortar and lots and lots of stainless steel, allowing us to make our beer right here in this place we love”. The American equipped brewery is located in Molonglo Group’s Dairy Road District, near the Dairy Road–Monaro Highway underpass. The near 20-thousand-metre complex will ultimately accommodate scores of tenants, including Barrio Collective coffee roasters, Vertikal Indoor Snow Sports’ three indoor ski slopes, and Bloc Haus climbing gym. Inside the brewery a spacious taphouse for up to 200 guests occupies the area between the entrance and the brewing equipment, located on an elevated concrete platform. The taphouse’s long bar – “Made of recycled Oregon timber from Thor’s Hammer [Yarralumla]”, says Hislop – forms the left boundary of the public area. In the middle, a large log fire welcomes winter visitors. Overhead electric heaters, suspended from the steel roof towering above, radiate more heat into this vast but hospitable industrial space. In the brewing area, Wade Hurley moves back and forth between the elevated control deck, with its access to the kettle, and four stainless steel tanks in soldier line on the concrete floor. Three 5,000-litre uni tanks (cylindrical at top, conical at bottom) accommodate beer under ferment or being conditioned. And at the end of the line, a cylindrical 5,000-litre bright tank holds finished beer ready for kegging or canning. Stacked rows of empty kegs stand ready to be filled as the new brews take shape under Hurley’s guidance. Vacant space beside the tanks, “Will eventually accommodate two 10,000-litre uni tanks and a canning line”, says Nick Hislop. Laurence Kain adds, “We currently have a mobile canning line running flat out ahead of our opening. But we’ll set up our own, probably after the summer rush when we can do it properly”. 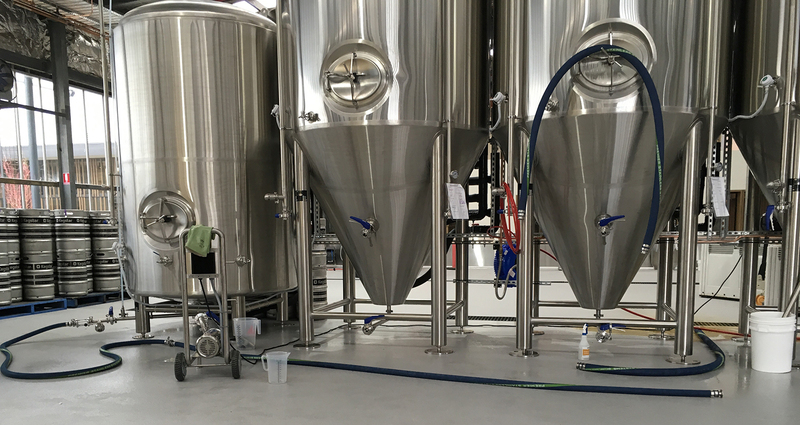 As Hurley fired the brewery up to capacity ahead of the 9 September opening, he busily kegged and canned the new brews as quickly as they flowed through to the bright tank. Hurley – head hunted from San Diego by Capital founders Tom Hertel, Laurence Kain, Nick Hislop, and Richard and Sam Coombes – says, “I love having my own brewery at last. It’s just great”. He took time out to describe Capital’s regular beers and a few made especially for the 9 September launch. Hurley models Coast Ale on California’s easy drinking ‘common ale’ style: malty, fresh and clean with the invigorating bitterness of Hallertau, Saaz and Dr Rudi hops. Tail Pale Ale leads with floral hoppy characters, with underlying sweet malt and balancing hops bitterness. Hops: Cascade and Galaxy. Turn up the volume. Though tame by current IPA standards, Evil Eye, at 5.8% alcohol, provides full-bodied drinking, led by aromatic hops, with a quaffable balance of fruit, malt and bitterness. Hops: Columbus, Topaz, Pacifica, Southern Cross, Motueka, US Cascade, and fresh Cascade hops grown at Batlow. This winter-warming stout combines dark-roasted barley malt, oatmeal, fresh coffee beans and “cold-drip” coffee. Tasted on tap at The Duxton, O’Connor, it revealed coffee and roasted-grain aroma and flavours with a soft, zesty, warming palate, mild bitterness and lingering coffee aftertaste. Springboard uses American yeast in a US-inspired variation on German wheat beer – with a salute, via the addition of spices and mandarin, to a Belgian style. Barley wine gets its name from its strength. However, being brewed from malted grain, it’s beer, albeit full bodied, smooth and malty. Provides mid-strength drinking, with the malty richness of brown ale and, “Some hops, but not very bitter”, says Hurley. Hurley calls Rock Hopper “Big on hops – all American, fruity hops, with an IBU of around 50 [a measure of bitterness] – amarillo, centennial Chinook and citra, added during the boil and dry hopped. With Hoppy Pils, Hurley set out, using German Pilsner malt, to make a, “Clean, crisp, dry, noble-hopped Pilsen style showcasing hops from around the world. It’ll be big like Pilsen Urquell, but not as fruity”, he says. At a pre-launch function in August, Laurence Kain announced, “One of the most exciting elements we’re pleased to announce today is our collaboration with the legendary Brodburger, so you’ll be able to enjoy some of Canberra’s best beer with Canberra’s best burgers”. 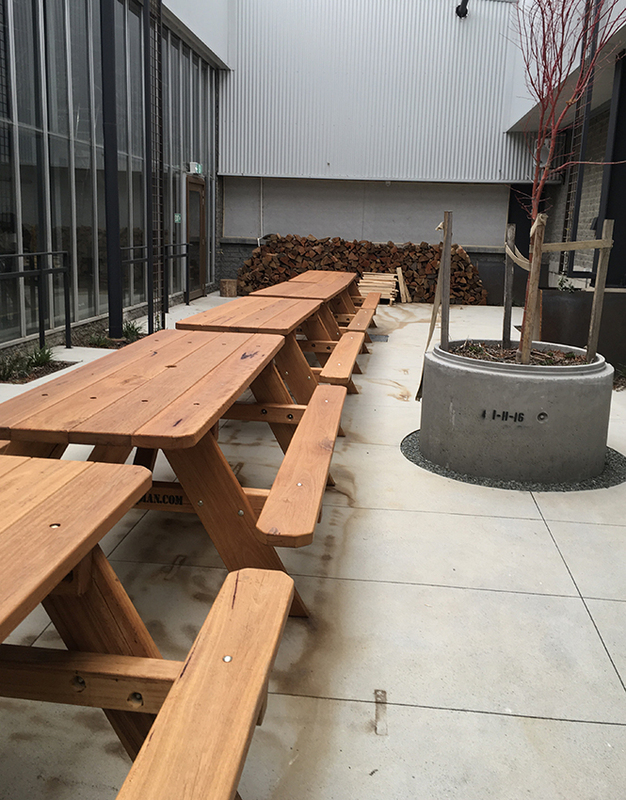 Beer, burgers and Brod dogs will be available in the 200-person capacity taproom, a 100-person rear courtyard–beer hall, with kid’s cubbyhouse; and in a 300-person beer garden near the front entrance. Like other small brewers in Canberra, Capital aims to minimise its environmental impact. A 60,000-litre tank provides water for the gardens. And all wastewater goes to a catchment tank for clean up before being discharged. “It’s more than compliant”, says Nick Hislop. He says, “The solids we extract from wastewater goes in with spent grain and hops for cattle feed. The Claystone Stud, Hoskinstown, collects it from us. They’ve got Black Angus and Herefords. Hopefully one day we can buy the beef and serve it here with our beer, completing the cycle”. 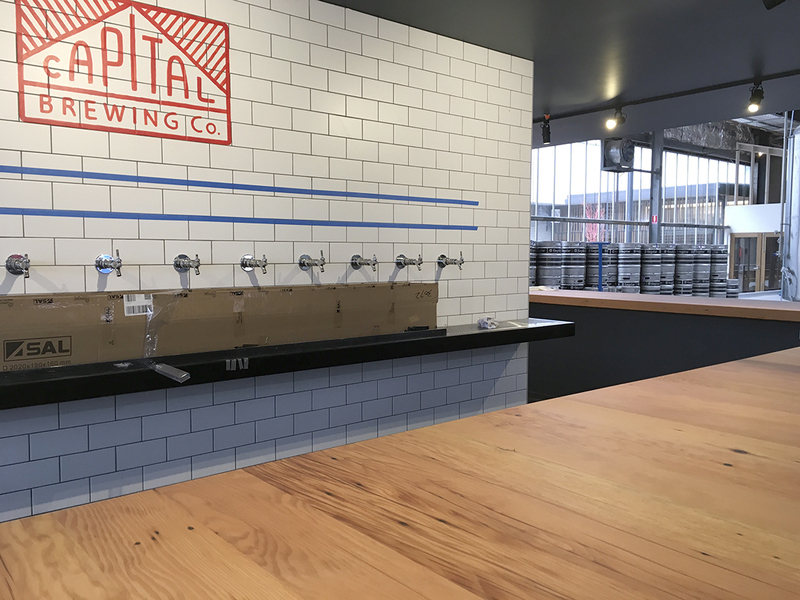 Capital Brewing Co opens at Dairy Road, Fyshwick, on Saturday 9 September. Trading hours are Wednesday to Thursday 4–10pm. Friday to Sunday noon til late.